More like a six-foot turkey. Dinosaurs ruled the earth for over a 150 million years, giving rise to countless species in that great length of time. It was entirely possible for two species of what we lump together as dinosaurs, T. rex and Triceratops for example, to be so distantly related you’d have to go back over 100 million years to find a common ancestor. It’s been roughly 65 million years since the extinction event that marked the end to the dinosaur’s reign, and allowed modern birds to evolve and radiate to where they are today. In this light, it’s easy to see why species that share an evolutionary “branch”, like T. rex and chickens, are more closely related than ones whose branches split over 100 million years ago, like T. rex and Triceratops. Given the similarity above, dinosaurs and birds have pretty different places in mythos, both IRL and in WoW. Dinosaurs, when they were first discovered, were given the name “terrible lizard” and have left such an imprint on people’s minds ever since. Birds, to many people, are for hobbies bird-watching, gardening, or photography. There’s definite overlap, but I think you see my point. That being said, it makes sense some places to talk about birds and dinosaurs together (evolutionarily) and separate at other places (thematically). When I talk about both together I’ll use the broader taxonomic grouping that includes both: Archosaur. And then we have the Crocolisks. Here’s come clarification: crocodiles come from a prehistoric lineage that falls in closer to dinosaurs and modern birds than it does to modern reptiles, not mention being in Archosauria. Now, most people group crocodiles with reptiles, but if we’re going to assert a dinosaur-bird phylogeny, we must also include crocodilians in there as well. Shall we continue? IRL, there is quite a stunning diversity among birds, with about 10,000 species ruffling their feathers in the world today. While that number can’t hold a candle to the inverts we covered last time (link), it’s roughly double the number of mammals! In-game, birds don’t only get glossed over, they’re vastly underrepresented, having less than 1/3 the species mammals do. And things only get worse if we consider all Archosaurs together. However, my main issue here is with the “Birds of Prey” family. This is the largest of the bird families with 38 unique looks, and when you look deeper it’s not hard to understand why. Blizzard has thrown all manner of birds into this group, regardless if they’re actually birds of prey. IRL, birds of prey refers to a very few families of birds, including hawks, eagles, falcons, vultures, and owls. Already we have a problem. Vultures are birds of prey, yet have been given their own family in game. Blizzard either needs to regroup Carrion Birds into Birds of Prey, or break Birds of Prey into several unique families. What families might those be, you ask? Well, aside from those mentioned above, we have three very NON-Birds of prey in this group: parrots, toucans, and seagulls. Fig 1. 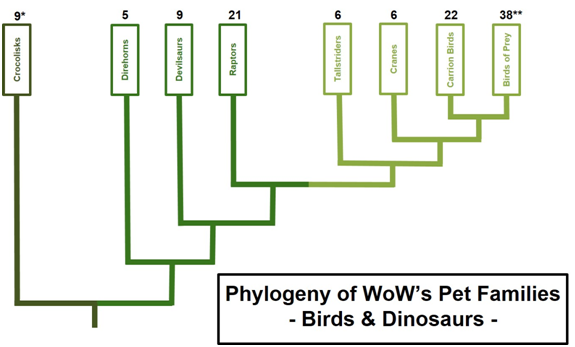 A phylogeny of WoW’s Archosaurs by in-game family. Numbers above each family represent the number of unique looks (species) within that family. The three different colors represent different lineages within Archosauria. *Crocodiles are Archosaurs, and more closely related to dinosaurs than other modern reptiles. **Birds of Prey are a “junk-taxa” for many birds that don’t fit elsewhere. The incredible dispersal ability of birds by flight has led them to radiate across the world. Heck, some birds even travel across the globe on an annual basis. Take the Arctic Tern, which makes trans-oceanic flights of greater than 12,000 miles from the Arctic to Antarctic and back, every year. Despite birds being on every continent, some families have notable absences. For example, Cranes are absent from South America, and have their highest diversity in Asia (which makes sense why they were introduced with Pandaria); flightless birds that we would group with Tallstriders (ostrich, emu, cassowary, etc) are almost all found in the southern hemisphere. With birds being so diverse, again, it’s hard to put them somewhere they aren’t IRL. I’ll give Blizzard a tentative pass here. Crocodiles are much more restricted in range. Most crocodilians can be found in the tropics, although a few branch into the subtropics. However, all crocodilians require both aquatic habitat for feeding and terrestrial habitat for basking and nesting. This restricts their range to rivers, marshes, or even the coasts in some species. We see this represented in-game pretty well, so it gets my thumbs-up. Dinosaurs ruled the earth, right? Well, dinosaurs did dominate the terrestrial scene for millions of years, so it makes sense they’d be found most everywhere. But how does that fit in to a world where they aren't the dominant vertebrates? Vanilla WoW gave us Un’Goro as a “Land of the Lost” type area, which is a pretty common fantasy/sci-fi trope. But when we start seeing raptors and the like elsewhere in Vanilla WoW (Barrens, Arathi) and those in Outland/Draenor, we run into larger evolutionary problems. Fig 2. 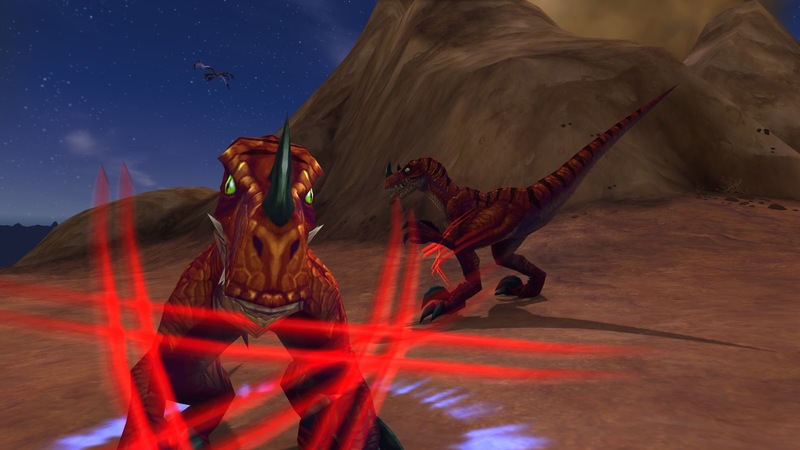 Did raptors come from Draenor when the orcs crossed the Dark Portal? Perhaps the orcs brought the raptors with them to Kalimdor when they moved over to establish Orgrimmar. Birds are one instance in WoW where there are many predator-prey interactions either visible or implied. You’ll often find Carrion Birds around the bones of some larger beast, or actually by the fresh corpse of an animal from the zone. In several zones, most memorably in Wrath onward, you’ll see some of the actual Birds of Prey occasionally take down a critter or mob! I recall several “meat piles” surrounding Devilsaur or Raptor nests, so it’s implied there as well, but I don’t recall ever seeing a dinosaur take down another animal in-game. If I recall correctly there’s a couple quests that revolved around getting something that a Crocolisk has eaten. Perhaps in Sholazar? Again, we see a lot of social interactions in Archosaurs, both IRL and in-game. Many species nest communally, and we see this in things like the rocs in Sholazar to the raptors in Un’Goro. Even crocodiles IRL are sometimes found in large groups, either basking or feeding together. Speaking of birds in Sholazar, there’s a great example of a symbiotic relationship between birds and mammals there. If you take the time to look before you shoot, you’ll see that several of the rhinos in Sholazar are carrying around tickbirds on their horns! When the rhino aggros, the birds fly away too! Funny enough, the tickbirds get their name, not from a sound they make, but their preferred food. IRL, tickbirds are real and commonly known as Oxpeckers. You know, the birds that ride on the backs of the elephants and rhinos? Previously, scientists thought they fed on parasites (ticks) and other insects the large mammals kicked up, but it’s more recently come to light that that’s only one part of their diet. When they can’t get enough blood from ticks, the birds will peck open a wound on the animal and actually drink its blood! Some relationship indeed. Fig 3. 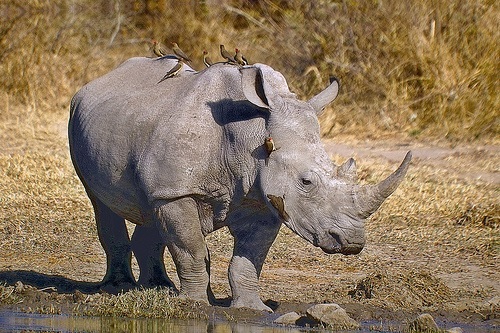 Oxpeckers catch a ride on the back of a rhino. and seek out the Shardhorn Rhinos and their Tickbird “friends”. Crocodiles exhibit parental care, just like birds. They’ll defend a nest and defend the young until they're big enough to disperse on their own. Not only that, but they also communicate vocally. Young call to the parent when they’re hatching, and adults will rumble to each other in social interactions, both like birds. While it’s more well-known now, the Velociraptors from Jurassic Park aren’t scientifically accurate. IRL, velociraptors were only waist-high, about 6-7 ft long, and covered in feathers. Originally, the clever girls of JP were Deinonychus, but Spielberg thought “raptors” rolled off the tongue better. Although, perhaps Utahraptor would have been better suited to the task than either. While some of the abilities here are believable (Crocolisks with Ankle Crack, or Devilsaurs with Monstrous Bite, for example) there are several that I think are just out of place. Let’s consider Carrion Birds with Bloody Screech versus Birds of Prey with Tenacity. Bloody Screech causes the Moral Wounds debuff, aka “Grievously wounds the target” (which reduces healing taken). Carrion feeders don’t usually take on prey that can fight back, so naturally wouldn’t have need of such an ability. On the other hand, Tenacity reads, “A master of lone survival…”. Now, I know that many birds of prey are solitary, but so too are many carrion feeders. In fact, carrion feeders must, by nature, scavenge for food, that may only be accessible for s short time, across great distances. Then, if they find it they have to digest rotting meat. If any bird has mastered lone survival, I vote Carrion Birds. I know that many of us grew up watching Triceratops battling its arch-enemy, the T-rex, only managing to come out alive by using its frill and horns as a defense. Since then there has been quite a bit of evidence that the frill of many dinosaurs (of the general triceratops-type) weren’t primarily to fend off predators, but more so for competition among members of the same species and courtship. The perception is that Triceratops were the tanks of the Dinosaur age, but a more likely story is that they were just trying to get lucky (and became a little tanky on the side). If you want a real tank, look to Ankylosaurus. Fig 4. 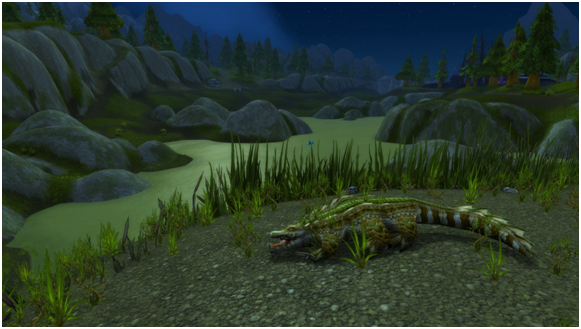 A Crocolisk in the temperate region of Loch Modan. Before the Cataclysm, this lake was home to an astonishingly high amount of crocodiles. Now, only a few remain. 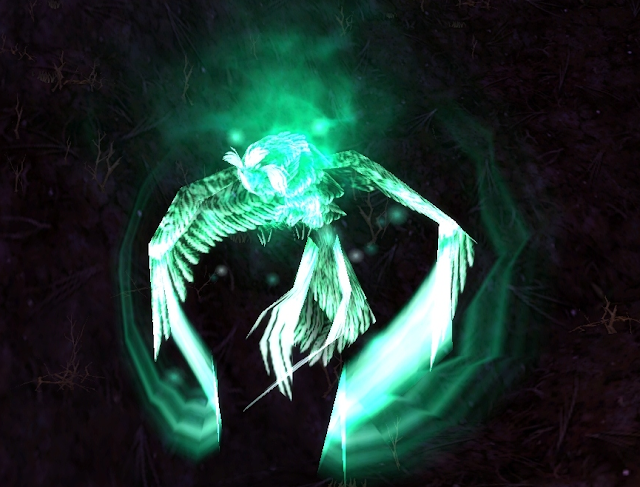 My biggest issue with birds in WoW, aside from the lack of overall representation, is the junk taxonomic group Blizzard has formed with Birds of Prey. They need to be broken up into several families, and then expanded on. Toucans do not go with Eagles, do not go with Seagulls, do not go with… And furthermore, while Carrion Birds" get their own in-game family, in real life they all fall into the category "Birds of Prey". If you want more flappy Archosaurs, there’s one group that already exists in-game, is spread about several zones, and has a pre-existing pet model as a base. Of course, I’m referring to Pterodactyls! Blizzard just needs to reskin newer bat animations, and viola, we have a new Archosaur family that goes wonderfully alongside the existing dinosaurs. I know I’ve barely mentioned them myself, but there are very few Tallstrider looks. The existing models haven’t seen much love since Vanilla, and yet still have a cult following. I’m looking at you, Mr. Pink Tallstrider owner (with matching transmog, to boot). One group of fantastical beings that Blizzard has yet to capitalize on as hunter pets are the gryphons/hippogriffs. These are clearly from fantasy, and at least part bird. These would have a great diversity of models, and would look stunning with many of the mounts in-game. I assume this would mean also instating wind riders as well, for the horde. Their ability could even be mount-related. Something along the lines of "Travelling Companion: While the pet is active, increases your speed while mounted by 10%. The mounted movement speed increase does not stack with other effects", similar to the Pathfinding glyph we currently have available. Aside from that, Dragonhawks are clearly some mix of avian descent. They seem to fit best in Archosauria, for sure. Could Sporebats be birds? They’ve been around for a long time (evidenced by Draenor), and can fly. Perhaps they’re a missing link, or maybe we’ll never know. Awesome article. Perfect before work read :) Thanks!